Since security tools keep an eye on the network traffic to detect malicious IP addresses, attackers are increasingly using legitimate websites and servers as infrastructure in their attacks to make the malicious software more difficult to detect.In the recently spotted malicious scheme, which according to the researchers is in its early stage, the hackers uses Steganography—a technique of hiding contents within a digital graphic image in such a way that’s invisible to an observer—to hide the malicious commands embedded in a meme posted on Twitter, which the malware then parses and executes. It’s worth noting that the malware was not downloaded from Twitter itself and the researchers currently haven’t found what specific mechanism that was or could be used by attackers to deliver the malware to the victims’ computers. 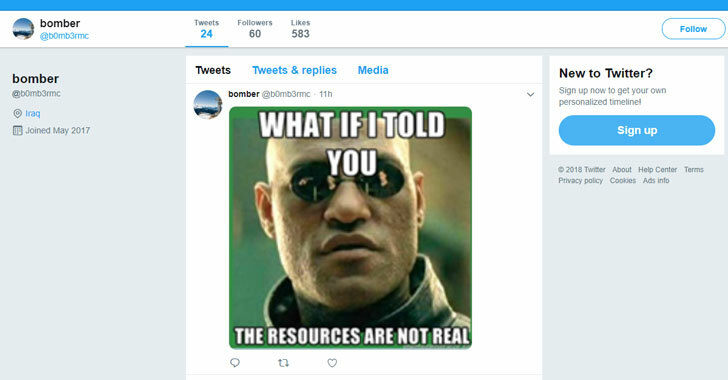 The good news is that the Twitter account used to deliver the malicious memes appears to have been disabled, but it is still not clear who is behind this malware and how the mysterious hacker was circulating the malware. Posted in Blog, News and tagged #Cybersecurity, #hacked, #Hackers, #mcsc, #twitter, cybercriminals, digital, malicious commands, malware, memes, posted, Steganography, The Messiah, Trend Micro, TROJAN, TROJAN.MSIL.BERBOMTHUM.AA.